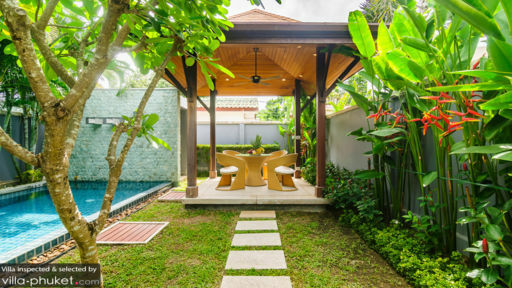 Built around a lush tropical garden, Villa Maya is a contemporary vacation residence with cool and shaded outdoor areas as well as cozy indoor spaces. 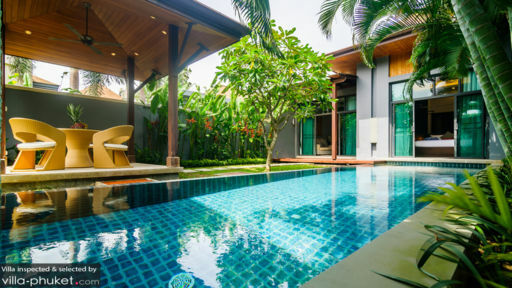 The property is masterfully laid out and provided with stylish furnishings that ensure comfort, modern amenities that guarantee convenience as well as a natural atmosphere that foster serenity and tranquility. Villa Maya, truly, is complete with all the important elements for utmost rest and recreation. The villa has two bedrooms. Both have king-sized beds and dedicated bathrooms. Although only one of these opens out right at the very edge of the swimming pool. 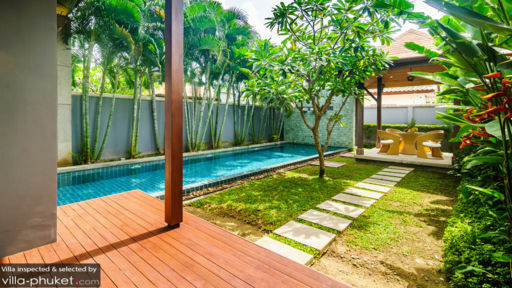 The outdoor area is equally divided between a well-kept lawn and an eight-meter swimming pool. Into its soothing, glassy and inviting waters you can, on impulse, simply allow yourself to fall. Up on the lawn is a semi-open sala where you can leisurely lounge to converse, to chill out, or to spend some me time as cascading water from the nearby wall fountain lulls you to relax and wind down. From the wood-decked covered terrace extending from the villa, you can step, through floor-to-ceiling glass and screen sliding doors, right into the living area. Here, you can all gather on the large and long couch in front of a widescreen TV for the much-anticipated episode of the newest hit series. Right next to the couch is the dining area. On the wooden table which can accommodate four, you can all sample one another’s delectable dishes which you all took turns in concocting at the adjacent modern kitchen installed by the nearby wall. In charge of the villa’s daily maintenance and operations is a staff consisting of a housekeeper, a pool attendant and a security detail. Just a three-minute drive from Villa Maya’s location is the white-sand beach of Nai Harn. Here, you can swim all you want as well as hop aboard a traditional Long Tail Boat and go on an expedition to neighboring Ko Bon, Ko Kaew, Ko Lon, Ko Aeo and Ko Hae – which is also known as Coral Island. Nai Harn also has a daily bountiful catch of fresh and delicious seafood. The must-try place is Sala Loi where you can also get a taste of the traditional way of dining – from a mat on the floor. Cap your day trip with a stop at the Phuket Shell Museum and at Promthep Cape View Point where you can get a glimpse of the magical sunset.